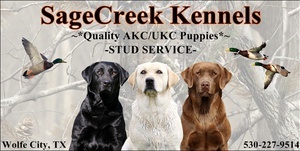 We breed the 3 AKC/LRC recognized colors black, yellow and chocolate. We strive to breed within the Labrador Retriever standards and for our pups to have intelligence, good looks and lots of drive and trainability in the field yet having that personable loving personality making them both wonderful family companions and excellent hunters! Great on/off switch and we try and choose studs that also suit their temperament, pedigree, looks and are from titled working lines.